Imagine the world's largest trees, breathtaking mountains, deep canyons, rugged foothills, and vast caverns! All of these await you on a visit to Sequoia and Kings Canyon National Parks. Located in the southern Sierra Nevada in central California, the parks include diverse landscapes that range from 1,370 to 14,494 feet. Mount Whitney, the highest point in the continental United States, stands on the eastern edge of Sequoia National Park. You may enjoy various activities, depending upon elevation and season, including scenic drives, ranger-led tours, cave tours, camping, day-hiking, backpacking, wilderness stock trips (with horses, mules, or burros), daytrips on horseback, rock climbing, cross-country skiing, snowshoeing, and sledding. Start your adventure with a scenic drive through both Sequoia and Kings Canyon National Parks along the Generals Highway, which offers expansive mountain and forest views. In any season, the oak-studded foothills of the Sierra Nevada provide a stunning foreground to the mountains in the distance at Sequoia National Park. The hills glow golden in summer, while winter sees their sides wear lush green. Stop by the Foothills Visitor Center, one of several in the parks, for exhibits, information, and a bookstore. Must-sees at Sequoia include the General Sherman Tree, the largest tree in the world. At nearby Moro Rock, climb almost 400 stairs up a granite dome for spectacular views of the surrounding area. Northeast of Moro Rock rise granite cliffs and the 1,200-foot waterfall of Tokopah Canyon. Tokopah Falls, a 3.4-mile round-trip hike from Lodgepole Campground, is most impressive in early summer but worth a visit at any time. A steep, winding road leads 25 miles and 1½ hours one-way from Highway 198 to the Mineral King area in Sequoia National Park. This road is not for the faint of heart, but bravery is rewarded by stellar views and hikes in the high country, which includes lakes, meadows, and red fir forest. In Kings Canyon National Park, visit the General Grant Tree, one of the largest giant sequoia trees in the world. A short hike along the North Grove Loop leads to a forest lush with ferns. 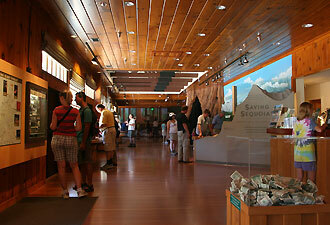 Stop by the Kings Canyon Visitor Center for exhibits, information, and a bookstore. The one-hour drive along the Kings Canyon Scenic Byway to Cedar Grove (possible between late April and mid-November) includes breathtaking views. This glaciated valley features towering granite cliffs, tumbling waterfalls, and the powerful Kings River. 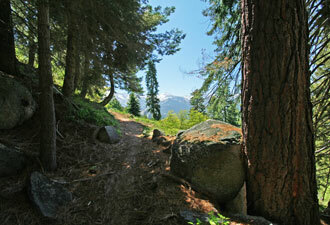 Don't forget to explore the underground world of Sequoia National Park. Beautiful formations, impressively large rooms, and ornate marble polished by a subterranean stream make Crystal Cave an unforgettable experience. Tours are offered from mid-May to October. Buy tickets at the Foothills or Lodgepole Visitor Center. Most visitors to Sequoia and Kings Canyon National Parks explore the areas listed above. But hardy hikers can see the hidden beauty on multi-day treks. Nearly 97 percent of the parks are designated or managed as wilderness. Come and enjoy these places at the degree of challenge that's right for you. Note from Steven & Fran: If you have a large RV it's best to park it outside the parks and make daytrips with the towed or tow vehicle.